Ready to celebrate the Year of the Pig? Here’s your guide to the biggest Chinese New Year 2019 celebrations. Chinese New Year (also known as Lunar New Year and Spring Festival) means a lot of different things to folks across the globe, but one thing holds true no matter where you’re from: the new year brings people together. 2019 rings in the year of the pig. The pig is traditionally associated with good fortune and wealth, so this is bound to be a lucky year for business ventures and love. It also means we’ll be seeing lots of pig themed events, floats, and symbols during the Chinese New Year 2019 festivals. Based on legends that detail of people defeating wicked mythical beasts with firecrackers (particularly the dragon serpent Nian), the Chinese New Year also provides time to remember ancestors, enjoy traditional food, and pay respects to the gods. Traditionally, the build-up lasts weeks, with families making peace with people, paying debt, cleaning up their houses to ward off evil spirits and bring in luck for the new year. Across the world, Chinese New Year is brought in with beating drums, fireworks, and crashing cymbals. In many places, it’s the most extravagant party of the year drawing in people from all cultures. While the new year is always a wild time, some cities take the festivities to the absolute extreme. Here are a few of the weirdest and most wonderful Chinese New Year 2019 celebrations across the globe. Isn’t a shocker that the most impressive celebrations can be found on mainland China and Hong Kong. People dream of seeing in the Chinese New Year in China, and those who celebrate there won’t be disappointed. Shanghai, the financial capital, pulls out all the stops with dazzling lantern displays across the city and fireworks every evening. Some of the biggest shenanigans happen in the capital, and the place to be is Atmosphere Bar, where you see the extravagant fireworks display from the World China Summit Wing. Countless people head out of the city to ice skate around sculptures at the snow festival, many of which are in the shape of that year’s lunar animal. There’s a real community feel to Chinese New Year in Beijing, and most people head to Ditan Park where historic reenactments happen every day, along with other performances and plenty of hearty food to keep everyone warm. 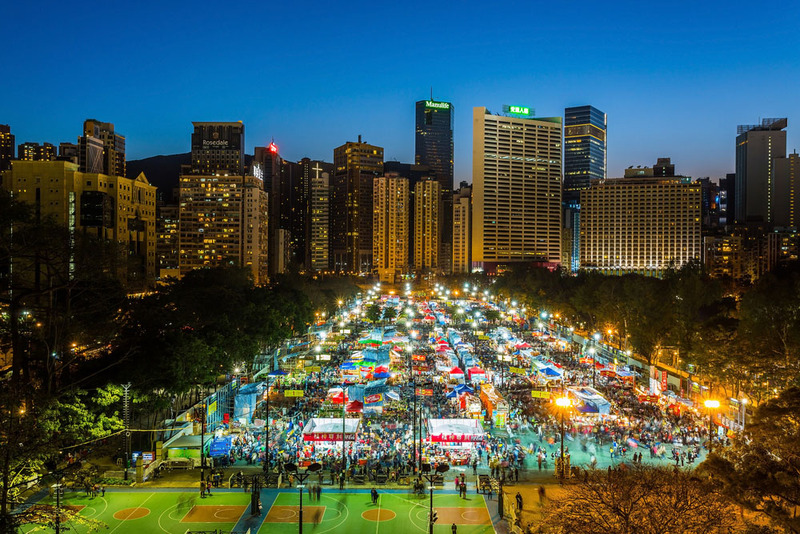 There are Temple Night Markets through the month, which carry on the fun, and are a firm favourite of locals and visitors alike. Hong Kong goes all out for new year with floats, the classic dragon parade, and a Lunar New Year fair. The harbour lights up with a huge fireworks display and international and local performers take the stage to sing. 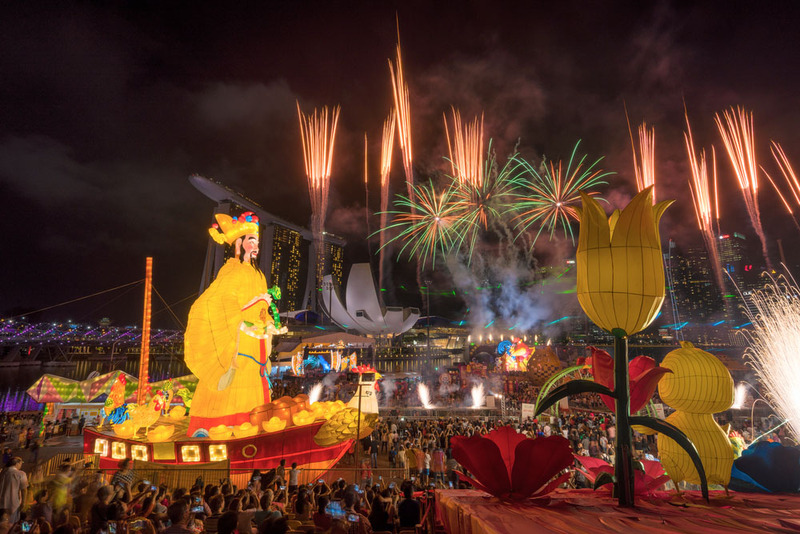 One of the most unusual and world-famous parts of Hong Kong’s festivities, however, takes place at the Sha Tin Racecourse on the third day of the New Year. Here, people take a chance on their new year’s luck and place bets on the horses. Hong Kong Disney throws its own events too, making a for a truly unique new year experience. Chinatown in London is always great fun, but during new year it ignites and takes the stage as the biggest Chinese New Year festival in Europe with hundreds of thousands of people attending every year. Extending to Trafalgar Square, you can enjoy stage performances all day, which include vibrant musical and theatre shows extending through the West End theatre district. 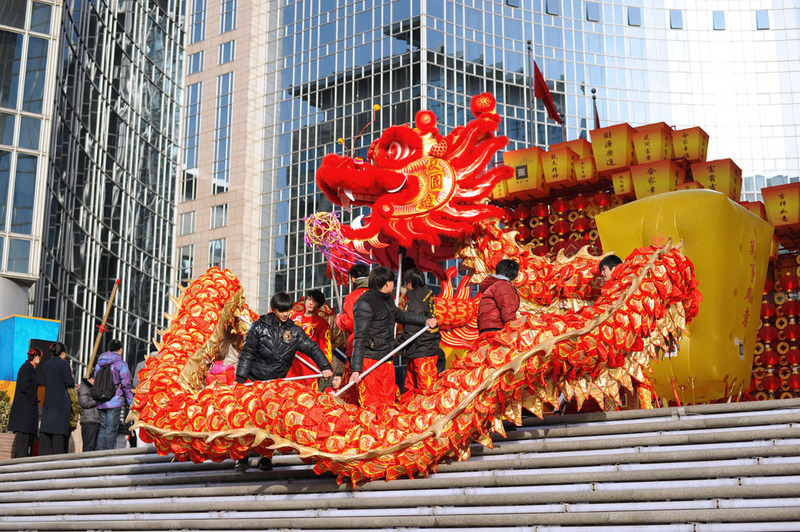 There are hundreds of street food stalls to choose from and the festivities conclude with a huge dragon parade. It takes fifty teams manning the floats and controlling the huge dragon and lion figures that snake through the city to the sound of gongs, music, and cymbals. While you are in London, check out our guide of other great ways to enjoy London in the winter. Chinese New Year, Mancester, UK. Sam foster / Shutterstock.com. 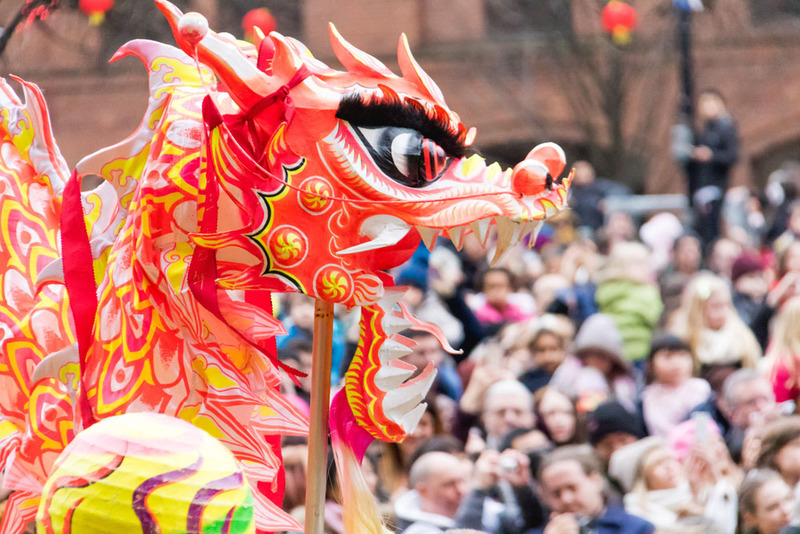 Equally electrifying in the north of the UK, Manchester holds its own celebration featuring a giant piglet, a golden dragon, and a dragon parade that has become legendary due to the 175-foot dragon that performs from Albert Square to Chinatown every year. Like London, the festivities last all day with traditional lion dances, street food, stalls, and live music. Chinese New Year Parade, Singapore. Sam’s Studio / Shutterstock.com. If you’re looking for the largest street performance and float parade in Asia, then Singapore is the place to find it. Starting with the famous Chingay Parade at the F1 Pit Building, a flurry of clowns, dancers, acrobats, jugglers, and other performers act out the key myths of Chinese New Year and leave the crowd in high spirits. Things get even more impressive down at River Hongbao in Marina Bar where they hold opening night events, the new year countdown party with an incredible fireworks display, and giant lanterns that depict figures of Chinese legends, dragons, the zodiac animals, and gods that float down the nearby river. 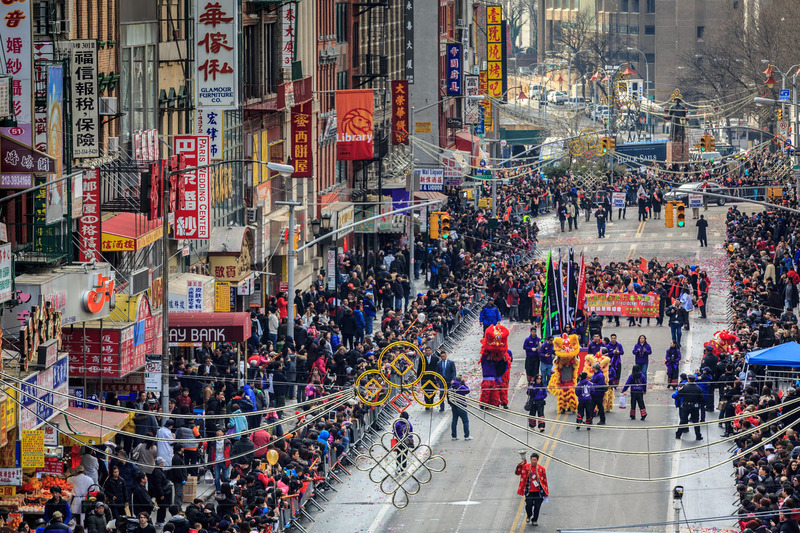 Many cities in the USA go all out when it comes to Chinese New Year, but the biggest celebrations are by far the ones in New York and San Francisco. In New York, you can expect to see martial arts performers, dancers, colourful outfits, and a dragon parade that heads down Mott and Canal Street on to East Broadway, Manhattan Bridge, Sara D. Roosevelt Park, and ends on Grand Street. It’s almost impossible to miss the gigantic and gorgeous display of music, dancers, floats, and dragons. Chinatown at Chinese New Year, San Francisco, CA. San Francisco also holds one of the largest celebrations in the world with events that last almost two weeks after the initial festival day. The huge parade that’s thrown by Southwestern Airlines includes a heady mix of folk dancers, floats, stilt walkers, marching bands and a 268-foot-long golden dragon. The crowds are intense, so there is even bleacher seating for people to watch the show in comfort. The evening ends with a stunning fireworks display. Aside from the parade, San Francisco is also home to fun experiences like the New Year Flower Fair and a street fair that last for weeks. One of the more unique events is the Miss Chinatown USA pageant with a coronation ball later in the month. Try to find a more exciting place to be than Sydney on Chinese New Year. 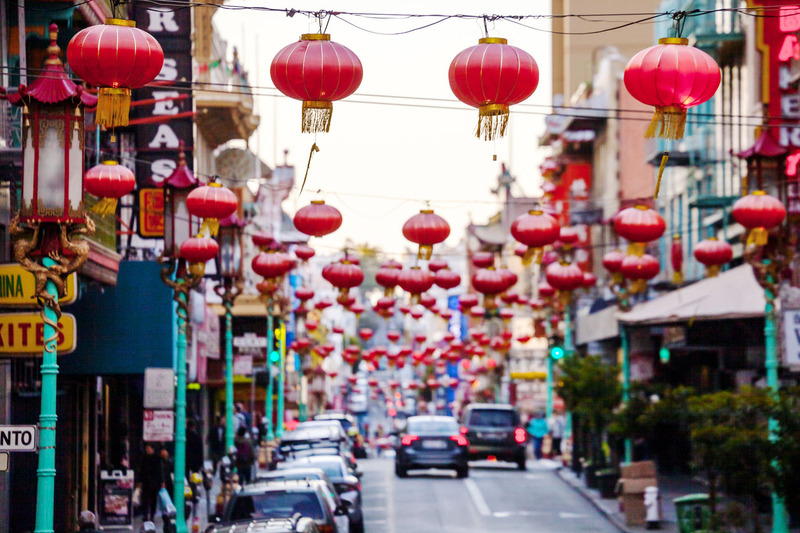 Their Chinatown district turns into party central for 17 days after the New Year celebration. Fireworks are thrown every weekend for three weeks, and the Chinese street food and markets last for the entire month. 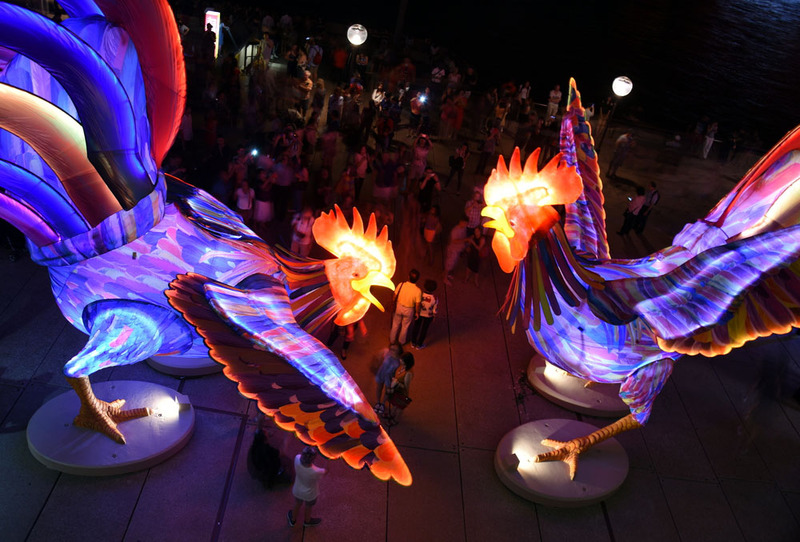 Incredibly, you’ll find dragon boat races on Darling Harbour and animal lanterns up to 15 metres tall lining the area. There’s live karaoke on top of Harbour bridge, which anyone can get involved in, and live performances of contemporary dance, traditional dance, and martial arts. More than 80 events collaborate to celebrate Chinese, Korean, Japanese, and Vietnamese culture. 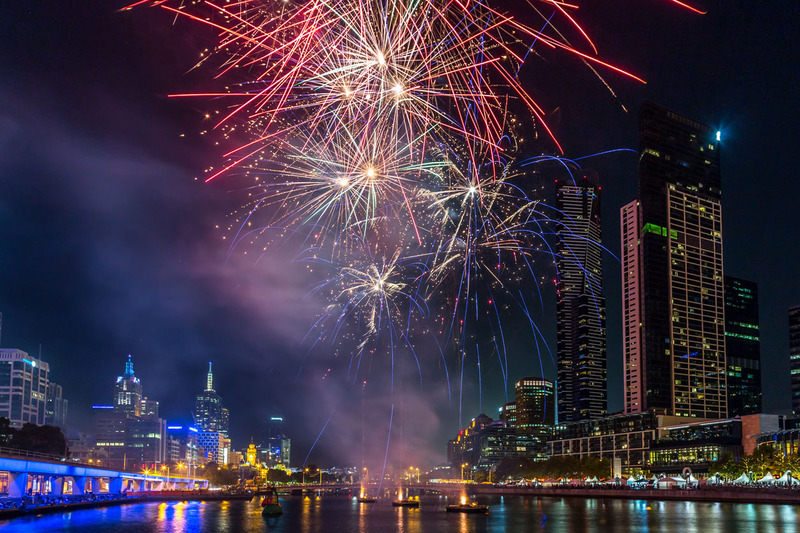 They don’t fall too far behind in Melbourne, with light installations that flow down the Yarra River and a lantern parade. 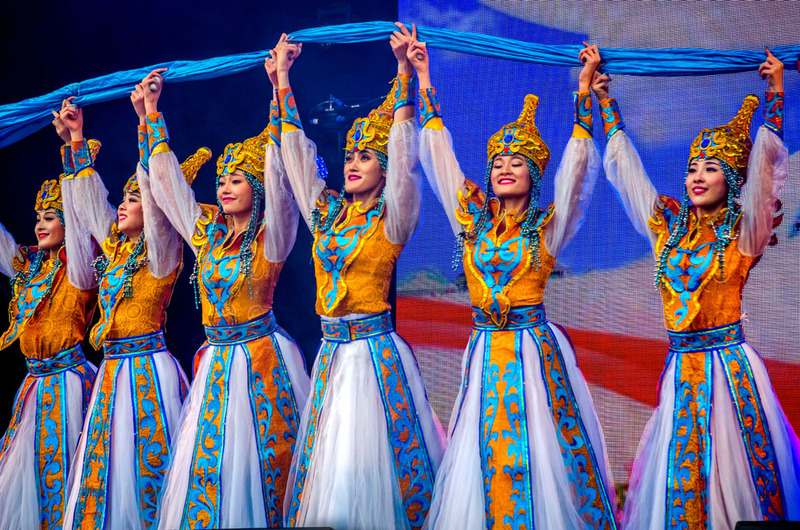 Three hundred performers light up the ten days of celebration, including flash mobs, magicians and a Chinese square dance competition. Street food and markets make this a really wholesome and fun-focused new year celebration that lasts the whole traditional period. 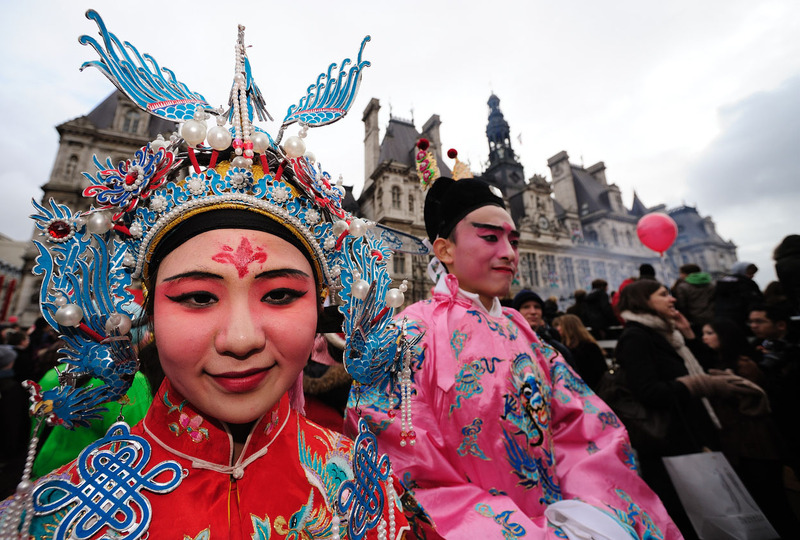 In Paris for Chinese New Year? Then you’re going to be in for a great time with celebrations lasting two weeks. The party kicks off with their famous ‘opening of the dragon’s eye’ ceremony (which is exactly what it sounds like, just with more firecrackers), and continues with a parade of brimming dragons, firecrackers, and bright orange koi fish. Everything happens around the Champs-Elysées, making for an awesome backdrop to spectacular street festivals. The performers here really go all out with their costumes, and Paris turns into a wash of colour that lasts for weeks after the celebration ends. Even the Eiffel Tower joins in as it glows red through the period and shop fronts are adorned in red and gold. 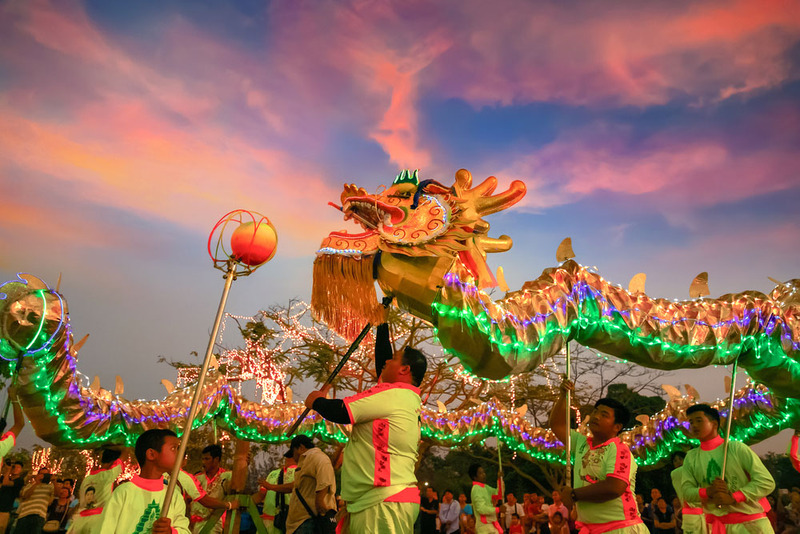 Celebrated all over Thailand, the Chinese New Year is one of the biggest events of the year. Bangkok is certainly the place to be with vibrant parties exploding throughout Chinatown, which turns a vibrant red from start to end with lanterns and lights. Yaowarat Road is closed off for the parade and lined with incredible street food before the dragon is led out with the rest of the performers. Amazingly, the Dragon fight begins when acrobats form a large human pyramid with the dragon to re-enact the original fight with the serpent Nian and scare off the bad luck. Truly impressive stuff.